Michigan’s Supreme Court Has A Rich History Of Expensive Judicial Races And Partisan Pressure When It Comes To Redistricting. A 2018 Ballot Measure May Hang In The Balance. Note: This story is the result of a collaboration with Bridge. 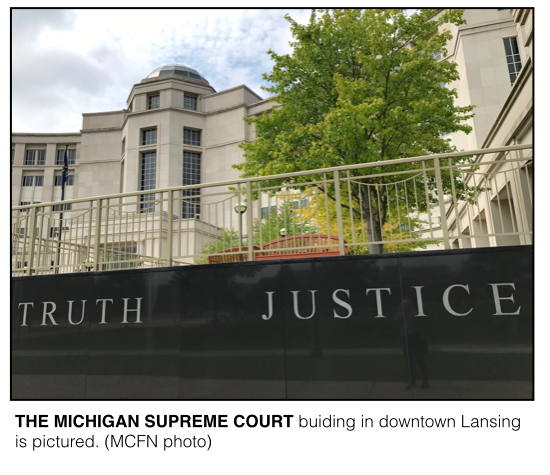 LANSING (JUNE 8, 2018) — On the morning of April 17, the campaigns of two Michigan Supreme Court justices facing reelection this year held a fundraiser inside the headquarters of the Michigan Chamber of Commerce. Eight days later, a committee that uses the chamber’s address and has so far received $185,000 in support from the chamber this year filed a lawsuit challenging a ballot effort to overhaul how Michigan draws legislative districts. It’s a suit that may soon land before the two justices benefitting from the April 17 fundraiser — Kurtis Wilder and Elizabeth Clement — and their five colleagues on the state Supreme Court. The fundraiser serves as but one example of connections between members of the state’s highest court — both past and present — and groups entrenched in fights over Michigan’s redistricting system. Over the decades, redistricting fights have forced the justices to rule on cases in which their political benefactors have strong opinions. Although Michigan’s justices appear on the November ballot without a party affiliation listed, they are nominated by political parties, making Michigan one of about 10 states that bring party politics into the election of supreme court justices. And campaigns for and against the candidates cost millions, with much of the money coming from powerful groups such as the Michigan Chamber, which has criticized the 2018 redistricting proposal, and the state’s two major political parties. Over the last three elections, the three groups have combined to spend about $20 million on Supreme Court races. In Michigan, there’s also a history of outside pressure when it comes to redistricting decisions. It’s a history that’s featured threats of impeachment and allegations of political partisanship. That history is getting renewed attention in 2018 as the proposed constitutional amendment on redistricting faces a legal challenge. The proposed amendment aims to take the power of drawing state congressional and legislative lines away from whichever political party is in power and give it to an independent commission. The Michigan Chamber, which represents about 6,500 businesses in the state, opposes the redistricting measure. On Thursday, a Michigan Court of Appeals panel rejected a challenge by a chamber-backed committee, Citizens for Protecting Michigan’s Constitution. A spokesperson for the group said it will appeal to the state Supreme Court. In Michigan, Republicans control the governor’s office, the state House and Senate and, by a 5-to-2 majority, the state Supreme Court. Under the current system, lawmakers redraw congressional and legislative lines every 10 years, with the party in power having control over the process. Opponents of the current system contend Republican legislative majorities gerrymandered districts to favor their candidates. They note, for instance, that in 2014, Republicans received about 50 percent of the statewide Michigan Senate vote with Democratic candidates getting 48 percent. Despite the close overall vote, Republicans won about 71 percent of state Senate seats that year. 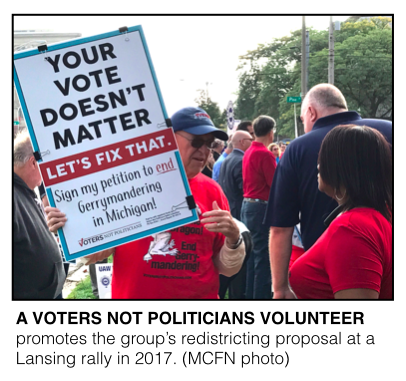 The Michigan Republican Party has already spoken out against the redistricting proposal, which comes from a group called Voters Not Politicians (VNP). VNP volunteers gathered about 400,000 signatures to advance its proposal for an independent commission. VNP raised about $959,000 as of April 20 through more than 10,000 individual contributions, a broader base of contributors than other state ballot proposals, according to campaign finance disclosures. The group describes itself as a grassroots organization. But some Republicans don’t see it that way. Meanwhile, five of seven current members of the Michigan Supreme Court were either nominated or appointed by Republicans. Wilder and Clement were appointed in 2017 by Republican Gov. Rick Snyder. They are expected to be nominated in August by the Michigan Republican Party for the seats they currently hold. But if the redistricting case is quickly appealed, as expected, they may well have to vote on the redistricting challenge before they are officially nominated by the party that opposes that very measure. Betty McNerney, a spokeswoman for the chamber, said in an email the chamber didn’t host the April fundraiser for the campaigns of Wilder and Clement, but merely allowed the justices’ campaigns to rent space for the event, as the chamber has allowed other organizations to do. The Wilder and Clement campaigns didn’t respond to a request for comment on the event or the pitched battle over redistricting. It’s unclear whether any chamber employees attended the fundraiser. According to the Michigan Chamber’s campaign finance disclosures, the chamber’s PAC reported giving $15,000 each to the campaigns of Wilder and Clement on Feb. 21, less than a week after the justices’ fundraising committees were officially established. In Michigan, judges can’t personally solicit campaign contributions. But their campaigns raise money through fundraisers the judges can attend and other methods. Over the last three elections involving eight races for Michigan Supreme Court seats, the nonpartisan Michigan Campaign Finance Network has tracked about $33 million in combined spending by candidate campaigns and outside groups. That includes 2012 when three seats were on the ballot, 2014 when three seats were on the ballot and 2016 when two seats were on the ballot. About a third of the tracked money has come from the Michigan Republican Party. The party has spent about $11 million since 2012 on TV ads talking positively or negatively about Supreme Court candidates and on direct contributions to Supreme Court candidates. The Michigan Democratic Party has spent about $7 million on Supreme Court races over that time period. Currently, there are only two justices nominated by Democrats on the seven-member court. The Michigan Chamber has also been a big player in financing Michigan Supreme Court campaigns. 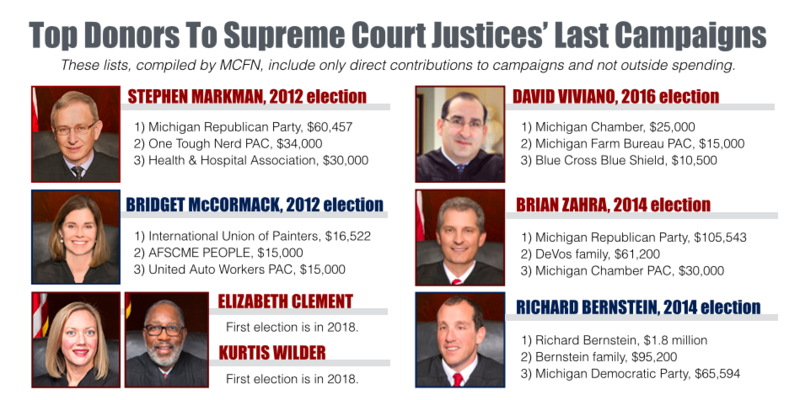 In 2014, the Michigan Chamber gave $30,000 each to the two Republican-nominated justices that year, Viviano and Brian Zahra. They remain on the court. “Our members take an active interest in many races and in this case they have made endorsements and provided support to judicial candidates whose judicial philosophy is grounded in the rule of law,” said McNerney, the chamber’s spokeswoman. The chamber has long played a role in judicial races. According to PAC Man, a memoir by the chamber’s former legal counsel, Bob LaBrant, the chamber’s PAC made its first contribution to a judicial candidate in 1980 “because of the importance of the court on redistricting.” The state was set to redraw its lines in 1981, leading to a legal fight that played out before the Michigan Supreme Court in 1982. LaBrant is still involved. He’s personally spoken out against the Voters Not Politicians proposal, and provided volunteer services to the chamber-linked group trying to block it in court. Citizens for Protecting Michigan’s Constitution filed its challenge to the Voters Not Politicians proposal in the Court of Appeals on April 25. After Thursday’s setback, the group says it plans to appeal the decision to the state Supreme Court. If history is any guide, things could get tense, and the state’s political parties will be watching closely. Joseph Swallow, a former Republican state lawmaker and retired Alpena County Circuit judge, said judges can feel pressure to not upset their party’s wishes in redistricting cases. The Kavanagh he was referring to was a former Democratic-nominated justice from the 1970s, Thomas Giles Kavanagh. He was also known as “Thomas The Good,” according to the book, Michigan Supreme Court Historical Reference Guide, researched by Jill K. Moore. In 1972, Kavanagh on the high court during a different era of redistricting. At the time, the state had a redistricting commission. That commission included an even number of Republicans and Democrats and tended to deadlock on picking a map. The deadlocks left the Supreme Court to select one of the maps proposed by members of the commission. In the 1972 case, Kavanagh refused to side with majority Democrats. Instead, he dissented. Four years later, Michigan Democrats didn’t renominate Kavanagh for the Supreme Court. Swallow, then a GOP lawmaker, said Democratic legislative colleagues told him in advance Kavanagh wouldn’t be re-nominated. Swallow went on to be the Republican nominee for Kavanagh’s seat in 1976. He ran against a Democratic nominee and Kavanagh, who ran as incumbent but without the nomination of a major party. Kavanagh won re-election, anyway, but the message sent by his party was clear. “To my knowledge, the Kavanagh episode did have the chilling effect of silencing any further serious opposition by a sitting justice against their political patrons,” Swallow wrote in 2015. 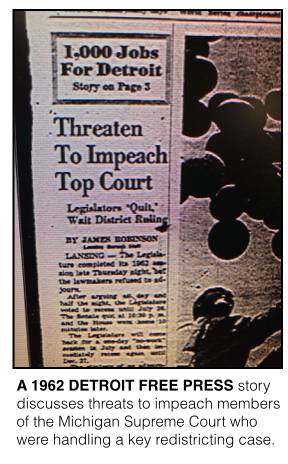 The 1972 case is just one in a line of major Michigan court cases over redistricting. In the 1960s, there were multiple legal battles over whether Michigan could continue to base its legislative districts on both population and geographic area, meaning some districts had many more people in them than others. According to the Michigan Supreme Court Historical Reference Guide by David. G. Chardavoyne and Paul Moreno, a majority of state voters approved a referendum in 1952 to allow state Senate districts to be based on geographical area instead of just population. At the time, 12 Democratic state senators had been elected by 46,000 more votes than the 22 elected Republicans senators, the book’s authors wrote. Gus Scholle, then-president of the AFL-CIO, led a legal challenge to how state Senate districts were drawn. Eventually, the Michigan Supreme Court, following the U.S. Supreme Court decision in Baker v. Carr, ruled in 1962 that the state’s process for drawing Senate districts violated the equal protection clause of the 14th Amendment and should be drawn based on population. Michigan’s 1963 Constitution set up an independent commission to draw district lines. The commission tended to deadlock, forcing the courts to get involved. 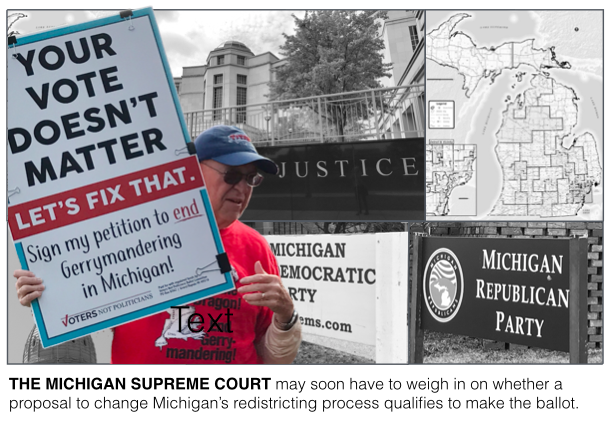 That played out until 1982 when the Michigan Supreme Court struck down the redistricting process laid out in the 1963 Constitution and appointed a former director of state elections to supervise the drawing of a redistricting plan. “The matter should be returned to the political process in a manner which highlights rather than hides the choices the people should make,” the justices wrote in a unanimous opinion. Decades later, the Michigan Supreme Court appears poised to soon step back into the redistricting debate with the Voters Not Politicians case. However, the legal questions in the case are less about redistricting and more about whether the proposal is a constitutional amendment or a far broader general revision of the Constitution. If, as the challengers argue, the measure is a general revision, it can not be decided by ballot, but instead would have to be approved through a full-fledged constitutional convention. Citizens for Protecting Michigan’s Constitution argues the proposal is a general revision and that Voters Not Politicians didn’t properly disclose all of the sections of the Constitution its proposal would affect. The lawsuit notes the VNP proposal is seven pages, and includes “amending, deleting, or inserting language across 11 different sections of the existing Constitution,” according to its court filing. But supporters of the Voters Not Politicians proposal counter that it focuses on a single change: altering how the state draws district lines every 10 years. Its proposal touts an independent commission, similar to those in states like Arizona and California. How the high court decides the matter will either frustrate Republican backers of the current system, or frustrate the hundreds of thousands of people who signed petitions to change the state’s redistricting process. Not surprisingly, those who watch Michigan politics and election law closely disagree on its fate. “This is pretty narrow and it deals with one subject matter,” Thomas said. Likewise, the nonpartisan and influential research group, Citizens Research Council, concluded the scope of the Voters Not Politicians proposal is “limited” and seems to meet standards laid out by the courts to qualify for the ballot. “The VNP petition deals with a single subject; legislative redistricting ... While it is long and complex, the scope of the proposal is limited,” the Citizens Research Council analysis found. During a gubernatorial debate in May, Attorney General Bill Schuette, a Republican and the state’s top law enforcement officer, said he does not think the proposal will make it to the ballot. He didn’t elaborate. At least one Democrat also views the VNP proposal as a general revision. Adrian Hemond, CEO of the political consulting firm Grassroots Midwest, has said publicly that he doesn’t think the Voters Not Politicians proposal will end up on the ballot. He noted that Republicans have a 5-2 majority on the Supreme Court, and even if they didn’t, the proposal is too broad. “There is no objective definition under which that is not a general revision to the Constitution,” he said. Sooner rather than later, the justices will likely decide the latest fight over how Michigan political districts are drawn, and by who.